"Never change a running system", is a saying used in the IT industry. This has also been the case in the last few decades for the reactive solvent "styrene" used in polyester mortars. For example, the presto putty consisted of between 10 and 15%, the resins between 30 and 40% of styrene. Despite all health concerns, so far no way has passed by this solvent and in every paint shop / workshop for the typical "smoothing smell". These times are now over. The styrene content, which can be sold in the self-service area free of charge putty and resin products, was limited to below 10% in the chemical prohibition ordinance (ChemVerbotsVO) published on 26.01.2017. Products with higher styrene content must be labeled with the H372 Hazard Identification Kit and the Hazard Pictogram GHS08 and may not be distributed to the private end user in the self-service area. In order to be able to offer the products as usual in the sales area, the qualities of presto quality putties have already been reduced to a styrene content of less than 10%. MOTIP DUPLI was not yet enough and developed styrene-free qualities in the laboratory of the putty production facility in Schwerte near Dortmund. As a result of the intensive laboratory work, we can proudly present a complete styrene-free range of repair and quality putties. The stinging styrene smell is passé. 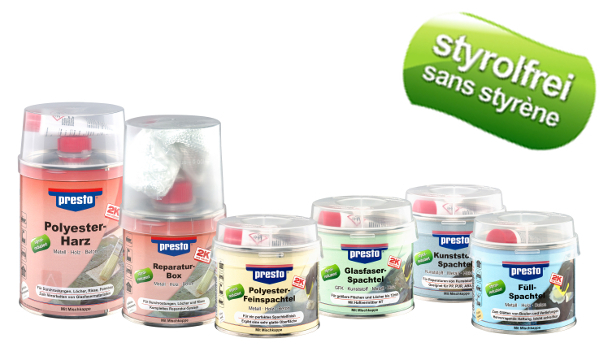 As a result, presto is setting new standards as the traditional brand in the putty sector. Let yourself be impressed by the new presto qualities!